Demanding a strong ROI from your investments is critical. And because a Project Portfolio Management (PPM) system is usually not “mission critical,” the need for a compelling ROI is even more important. But it also stands to reason that if there was one investment that would enable you to complete more projects, more projects faster, and projects with better returns – that investment would likely produce amazing returns. 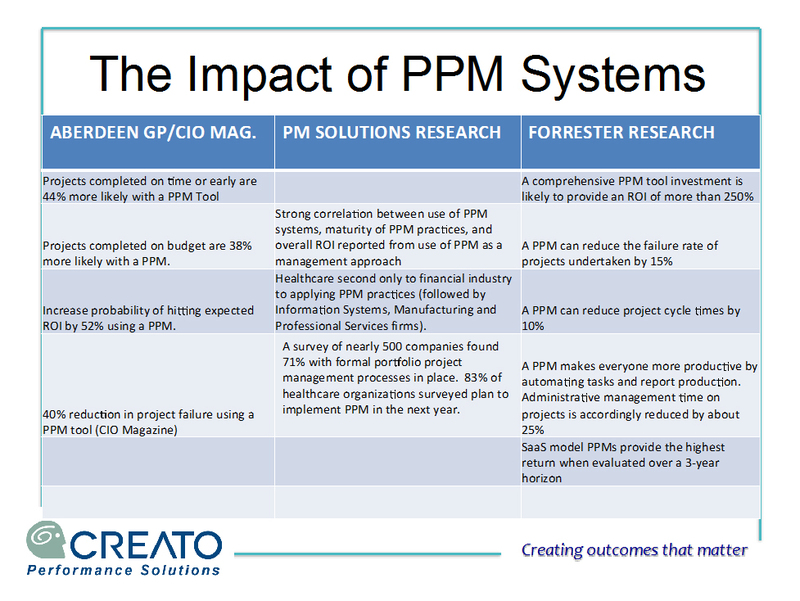 In the case of PPM, that is exactly how the ROI is realized. "The business problems being solved via COMPASS involve mostly process improvements and system inefficiencies intrinsic in the delivery of integrated care services. Benefits realized in the first year of implementation of COMPASS include $134,000 ROI. The system has harnessed a unified team approach to problem solving center wide while ensuring executive level engagement with every launched project." But the benefits of PPM go well beyond financial return. Everybody is made more productive when they leverage the PPM. How many hours per month do you devote to the preparation of reports or presentation for review by internal audiences? Ask yourself, is this a good use of your time? A competent PPM gives you back that time. No longer are you pushing reports to ambivalent audiences – the audience will pull the most recent report to them on demand, and that report will be automatically updated for them! It should come as no surprise that most licensees of a PPM system report to us that they have recovered the cost of their investment from the very first project. Creato has documented returns of 7:1 across 150 separate projects completed by 10 clients over the past 10 years. Most clients experience returns of 6:1 in the first year alone! You use a brokerage account to manage your investments for a reason: to seek higher returns. Why not bring the same level of discipline to an environment where the risks and returns are exponentially greater? How can you afford not to!